View More In Stained Glass Panels. The most regal home decor is real and authentic. That’s why our hanging stained glass panels are carefully pieced together with real glass. 289 pieces of amber, red, green, blue and orange glass create a dazzling floral pattern that casts a kaleidoscope of color when hung in a sunny window. The classic Fleur de lis (or flower de luce) french lily stands majestically as the centerpiece of this radiant, vintage design. Brilliant, deep blues provide a captivating contrast to the amber and orange backdrop, adding a vibrant color play to any space. 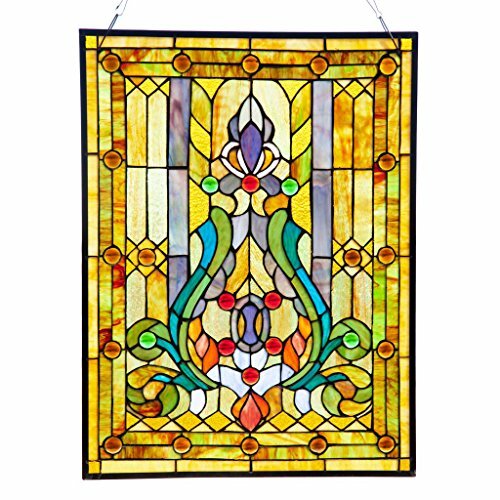 At 24.75 x 19 inches, this vertical stained glass hanging is just the right size for most standard windows. The portrait-style frame can be easily transferred to a different room to capture more sunlight, redecorate a new space, or add a bit of privacy. Hang the Fleur de Lis Stained Glass in a window to capture the sunlight, and enjoy a breathtaking range of colors. The design can brighten up a windowsill and add a unique touch of visual interest, or it can be hung on a light-colored wall to bring a pop of color to a study, bedroom, or living room. Frank Lloyd Wright Oak Park Playroom Window Stained Glass - 14" x 7.75"
Chloe Lighting Sunnyville Tiffany-Glass Sunflower Window Panel 16"